Some patients are put off dental implant treatment by the time that it takes. 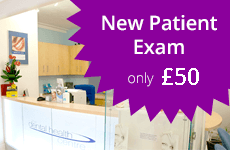 We can offer you Immediate Fixed Teeth in a day! This can be for a single missing tooth to a full set of teeth. The original idea was developed by Nobel Biocare with their ‘All on 4’ solution. This technique is widely available on most implant systems now. It’s not always suitable for everyone. Don’t suffer needlessly with uncomfortable and insecure dentures, failing crowns and bridgework or loose teeth that need extracting. 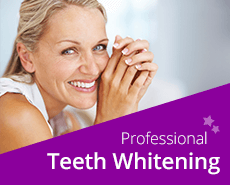 Join us for a free, no obligation consultation to discover how you can get instantly beautiful and secure teeth in a day. Advances in implant technology mean that we can now place the dental implant ‘root’ complete with a temporary tooth in just one day. Traditionally, dental implant placement meant that once failing teeth were removed the gap would either be filled with a temporary denture or temporary bridge or just left while the mouth healed. But with ‘Teeth in a Day’ this is no longer the case. Instead you have secure, temporary, fixed replacement teeth that allow you to speak and eat with confidence in just one day. The final, perfectly crafted implant bridge is then fitted around six months later. The typical single tooth implant involves the initial removal of the failing current tooth. A CT scan will reveal the amount and thickness of bone into which an implant can be placed. Provided there is no obvious infection around the current tooth and there is plenty of bone, it is possible to remove the tooth, place an implant and a temporary crown all in one visit. This will restore the appearance immediately but the implant will take 6 to 8 weeks to integrate to the jawbone. For this reason the single tooth implant should not be used for chewing during this healing stage. Once the implant has fused to the bone the temporary crown can be replaced with a permanent one and it can now be used as a normal tooth. The more common way to replace a failing tooth would be to remove the tooth and let the gum heal for 6 to 8 weeks. This will ensure that any residual infection has cleared up. The implant is then placed and left buried at the gum level or just below the gum level while it fuses with the jawbone. Only then is a final crown placed. Although this takes longer it is often the best way and sometimes the only way. It may take longer and there are more appointments but the results are worth it. With this treatment option we are replacing a full set of teeth using four to six implants, either all the uppers, all the lowers or both. Because we are joining all the implants together they can be used for chewing soft foods from day one as they get their stability from the fact that they are all locked together. Here is the protocol we use. Stage 1. A full consultation including a CT scan (benefitting from our in-house CT scanner) for assessment of available bone and the identification of key structures such as nerves etc. Our CT scanner is one of the latest generation Sirona XG3D CBCT scanners that has been developed specifically for dental use with a greatly reduced radiation dose compared to hospital CT scanning. 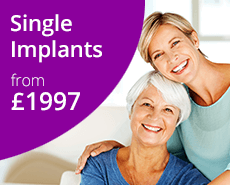 Suitability for immediate implants is assessed and a treatment plan is formulated. After discussing all the options and agreeing on a treatment plan we can move on to stage two. Stage 2. Initial impressions and a jaw bite are recorded; the colour, size and shape of the temporary fixed bridge are decided. A visit with the hygienist may also be required to make sure that the teeth are free of debris and the gums as healthy as possible - ready for the next stage. Any other acute dental infections will also need to be dealt with. Stage 3. An early start, under local anesthesia, the remaining teeth are removed and the implants placed. An impression of the implants is taken. This first stage takes between two to three hours. While you relax the technician now gets to work on making the temporary acrylic bridge. A trial fit may be undertaken after lunch and after any necessary refinements, it is fitted later in the afternoon. Once fitted you are free to go home, rest and have some supper. We recommend that you limit your diet to softer foods during the first two months while the implants heal. We check you again in eight to ten days to make sure everything is healing as expected, remove any sutures and to check and adjust the bite. Stage 4. After six months the temporary acrylic bridge can be removed, new impressions are taken and the final bridge made. The final bridge can either be made from a strong framework with acrylic teeth or a strong framework with porcelain teeth. My dentures are now absolutely rock solid on two implants. If you can’t eat, you’re in trouble. I am absolutely delighted.